A few months after graduating from college in 1995, I found myself on an overnight train heading from Brussels to Paris with a childhood friend. Passengers slept on their backpacks as the train chugged along, but I was wide awake, tossing and turning in my upright seat, unable to get comfortable enough to sleep. I pulled out my journal and alternated between writing and staring out the window into the darkness for the next few hours. Backpackers stirred as the train made its way into Paris’ Gare du Nord station. Remembering Monet’s train station paintings, I visualized him with his easel, paints, and brushes capturing the trains coming and going in this early morning light. We hopped off the train with our backpacks stuffed with essentials: clothing, a six-inch thick Let’s Go Europe guide, toiletries, shoes, passport, train tickets, Walkman, cassette tapes filled with favorite recorded songs by artists such as The Cranberries and The Goo Goo Dolls, and journal. Consulting our guidebook, we decided on a hostel in the Fifth Arrondissement. Exhausted, I stumbled the few blocks out of the Saint-Michel metro one exaggerated step at a time to a large white cinder block building that stood out among the city’s Haussmanns. We made our way through the light and airy lobby filled with couches, big windows, and a chandelier and up to the desk to reserve a room. Eager to drop our packs, I couldn’t wait to go horizontal after a sleepless night. Without realizing it, we’d chosen to visit Paris during Bastille Day celebrations so the city was covered in blue, white, and red. During my time visiting da Vinci’s Mona Lisa, Venus de Milo, and Monet’s Water Lilies, I became an avid consumer of baguette sandwiches, learned “Parlez-vous anglais?,” and struggled with counting francs. I fell in love with the City of Light. 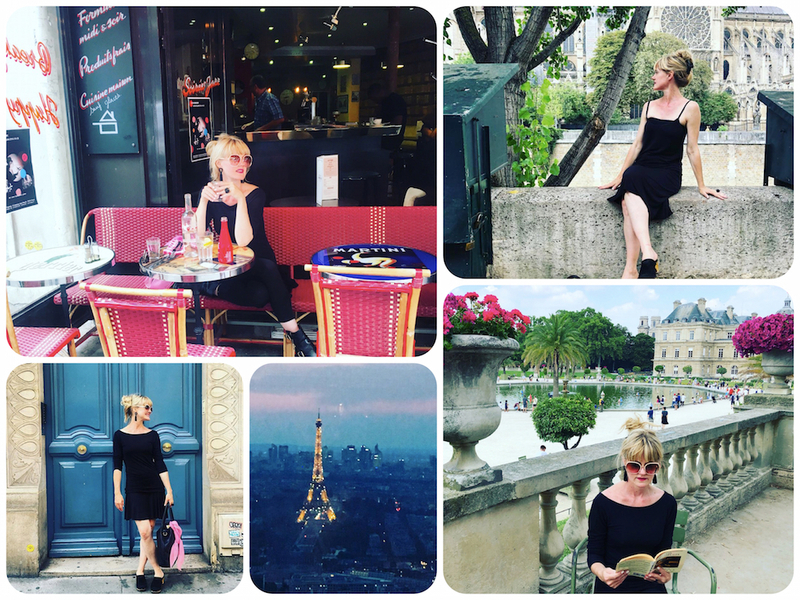 The bookstands along the Seine, fine art, architecture, pastries, and style won this Oklahoma girl over. I returned again in 2009, nearly 15 years later and am lured back each year. Paris is my happy place. My time there serves as a battery recharge—a sacred opportunity to step out of routine and into an environment that exudes beauty. I’m often asked, “Why Paris? What makes it so special?” Trying to answer this is both simple and complicated at the same time. Open-air markets filled with fresh produce displayed in colorful rows. Iconic arched bridges enhanced with gold leaf statues and iron lampposts. Lingering at sidewalk café to sip pots of green mint tea for hours. Black clothing and ballet flats. Flower markets filled with peonies, roses, and lilies displayed by color. Passion for physical books. An abundance of bubbly and rosé. Rows of Hausmannian buildings. Details inside these buildings: crown molding, fine linens, crystal chandeliers, antique furnishings, colorful front doors, wrought iron balconies filled with flowers. The encouragement to stroll aimlessly—flâneur—entirely on foot. Gertrude Stein and Hemingway’s homes. Rose macarons, Pain au Chocolat, crêpes, and frites. Moroccan hammams, spas, and lingerie enhanced with lace, bows, and ruffles. Gothic churches, the Arc de Triomphe, and the Eiffel Tower. Pharmacies filled with skin care potions. Well-manicured gardens filled with greenery, statues, and flowers. Perfume. Croissants. Scarves. Men in red pants. Dogs allowed in restaurants. Bikes, motor scooters, and kick scooters as common forms of transportation. Museums filled with masterpieces. Edith Piaf and Carla Bruni. The sounds of an accordion. Red lips. The Shakespeare and Company bookstore and café. When I return from jaunts to Paris, I try to keep the feeling alive. I walk or bike to and from appointments. I spray my face with a vitamin C infusion and dab on eye cream. I listen to Paris cafe music. I pick up flowers and produce from the market. I meet friends for tea. I wear noir, red lips, cat eye liner, and a colorful scarf. I have rosé during dinner. I sip green tea with mint. Before bed, I spritz perfume and crawl under soft linens with a book in hand. P.S. Below is a 25-minute video I recorded while in Paris last month introducing my new friend François, a peek into the Penning in Paris retreat, and words of wisdom from the book Paris Letters. You made me cry! About 10 years ago, I spent a month in Paris. It was amazingly transformative. I was sobbing on the flight home. I swore I wouldn’t return until I can stay permanently. It was too heart wrenching to leave. Your essay caught the reason(s) why. Loved reading about your first visit to Paris. My first visit to Paris was in the 80’s and I remember lugging one of the travel books around. My traveling partner and I ended up in a small hotel appropriately named Hotel California with a very small bathroom. Paris certainly has an atmosphere that isn’t duplicated anywhere else. Thanks for reminding me of slowing down and savoring those memories and trying to bring it back into my life. Oh my. I now understand and long to feel your love for Paris. You make me want to feel all the sensations you savor on your trips. Thank you for giving me another desire for my bucket list.